A guitar pedal effect (or software emulation thereof) that enables the player to adjust the cutoff frequency of a resonant filter (usually band-pass) by rocking the pedal with their foot, creating a characteristic guitar sound often heard in funk, blues, psychedelia and other styles. Auto-wah plugins (and, indeed, any synth or sampler) can achieve the same effect, but without the pedal, the filter cutoff instead modulated by an LFO, an envelope follower or anything else you like. The standard audio file container format for Microsoft Windows, although readable and writeable by any modern operating system. Wave files use the extension .wav, causing them to be commonly referred to as WAVs (while technically incorrect, the term is widespread and accepted). Although they can contain compressed audio, they're almost always employed uncompressed. The wave file is the standard for recording and playing back audio on Windows PCs, and it's second only to AIFF on Macs. Indeed, pretty much all modern music software supports both WAV and AIFF formats. In music software terms, typically refers to a graphical representation of an audio signal, plotting time on the X axis and amplitude on the Y axis. Although waveforms are primarily used as a visual reference for audio editing and amplitude assessment, some audio editors and DAWs allow audio waveforms to be edited directly using a 'pencil' or other graphical tool. This is mostly useful for lowering excessive volume peaks, but can be put to creative - albeit probably rather glitch-orientated - use, too. Elsewhere, a waveform refers specifically to a periodic waveform such as a sine, square, sawtooth or triangle wave, or indeed, absolutely any repeating wave pattern. A type of synthesis using sampled sounds. These 'waves' are arranged in sequences and played back contiguously, and each wave is independently editable in terms of pitch, duration, level and fade settings. The result can be anything from smoothly blended evolving sounds to discretely stepped wave progressions.The classic example of a wavesequencing synth is Korg's legendary early 90s Wavestation - now available virtually in Korg's Legacy Collection - which introduced the concept in the first place. Windows Driver Model. The standard Windows audio driver, which ties in closely to the Windows kernel and provides easy compatibility for manufacturers of consumer audio interfaces. For serious music production, Steinberg's device-specific ASIO driver is vastly preferable, which is why all high-end interfaces ship with this kind of driver. The processed signal that comes out of an effects plugin is its 'wet' output, while the unprocessed signal that goes in prior to processing is referred to as 'dry'. Many plugins nowadays feature a wet/dry mix control, for blending the dry and wet signals at the final output stage - a technique known as 'parallel processing'. When effects are inserted into auxiliary busses to be fed by the sends on individual mixer channels, their output should generally be set 100% wet, since the dry signal is already present in the mix on the channel you're sending from. A random signal of equal power at all frequencies, typically generated by a synthesiser's noise oscillator. White noise is particularly useful for adding cut, definition and attack to synthesised drum sounds. And being very amenable to filtering - thanks to its broad frequency range - it's also an excellent option for risers and general 'whoosh'-type sounds. The American name for the European semibreve, a whole note is a note that lasts for four beats of a bar in 4/4 time. As the MIDI keyboard is to the trained pianist, so the wind controller is to the skilled woodwind player. Looking like futuristic oboes, clarinets or soprano saxophones, devices like the ultra-posh Eigenlabs Eigenharp and those in the Akai EWI and Yamaha WX ranges enable MIDI notes and accompanying CC, pitchbend, aftertouch and expression data to be sent to anything capable of receiving it. By far the world's most popular computer operating system, Microsoft Windows was first launched in 1985 as a graphical interface and shell for MS-DOS. Since then, it's been through many versions - including the landmarks Windows 3.0, 95, XP, Vista and 7 - the latest being the touchscreen-firendly Windows 8, which runs on PC, tablet and smartphone. As far as the musician is concerned, assuming they have an audio interface with a solid ASIO driver on PC, there's no significant functional difference between the same music software running on Windows or Mac OS X. The only buying decisions to be made between the two operating systems centre on their general usability, exclusive applications (Logic Pro on Mac and FL Studio and Sonar on Windows, for example), and whether you want to buy into the relatively closed shop that is the Apple ecosystem, or the 'wilder' but generally cheaper and far more open (hardware-wise) world of Windows. Wireless Sync-Start Technology. A wireless protocol invented by Korg that enables their iOS apps to synchronise playback and tempo information across devices. It works over Bluetooth, with one iPad, iPhone or iPod touch serving as the master and the other as the slave: adjusting tempo and starting playback on the master does likewise on the slave. Windows Media Audio. Microsoft's own set of audio compression codecs and file format, originally created as a rival to MP3. 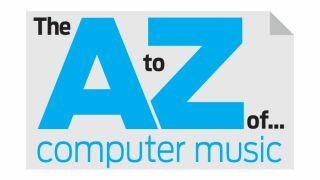 While WMA didn't make much of a dent in the ubiquity of that all-conquering format, it has found its place in all manner of devices and software media players. do it, and it can be transmitted and received over S/PDIF, ADAT, TDIF and other connection types, in a master/slave configuration. Today, you're only likely to find yourself working with word clock if you need to chain multiple audio interfaces (via the aforementioned hook-ups or Ethernet), or integrate digital outboard gear into your setup. Even less of an issue for the software-based producer than word clock, wow is the slow fluctuation in pitch that inevitably occurs with playback of analogue tape on a tape deck, due to their mechanical imperfections. Although it might sound like something we should all be happy to see banished to the music technology dustbin forever, some tape emulation plugins actually feature the controls for dialling in wow and its higher-rate sibling, flutter, for vintage authenticity, alongside the equally retrospective saturation and hiss algorithms that usually accompany them. A software 'shell' into which plugin instruments and effects can be loaded in order to convert them to another format. FXpansion's VST-AU Adapter, for example, wraps VST plugins in an Audio Units wrapper to be used in Audio Units-compatible (and VST-incompatible) hosts. Once also referred to as the Cannon connector, since it was invented by Cannon Electric, what is now almost universally dubbed the XLR is a three- or seven-pin connector (there are also four-, five- and six-pin variants for lighting and video equipment) that carries a balanced signal between suitably equipped microphones, instruments and receiving equipment -audio interfaces, mixers, effects, etc. The main advantage of XLR (and its 1/4" TRS jack sibling) over the unbalanced alternatives is lower interference and noise thanks to its shielding, earthing and polarity-opposed 'hot' and 'cold' (not 'left and right') connectors. Interestingly, the name XLR comes from the connector's designation by Cannon as the X series, its Locking mechanism, and the Rubber insulation around the female contacts. While they're primarily known as the manufacturers of musical instruments from pianos to drums (and the classic DX7 synth, of course), Yamaha also have a part to play in today's software industry: they're the parent company of Cubase developer Steinberg and are also behind the Vocaloid vocal synth. A 'talking' bass patch/sound that came to prevalence through the weird and wonderful genre of dubstep. While there are plenty of creative variations on the idea, the basic patch is created by running a harmonic rich waveform (a square wave works well) through a low-pass filter with plenty of resonance. The cutoff is then modulated or automated to arrive at a wobbly, 'wow'ing sound, and to get the formant-esque effect, a bitcrusher is applied, reducing the sample rate (using its downsampling/resampling mode). and tweaking the filter cutoff modulation for a tighter/longer 'y' sound at the start of each 'yoi'. You could also go about making these kind of 'talking' sounds using a formant filter, which purposely mimics human vocal tract resonances. A currently popular buzzword in filter technology. ZDF filters aren't actually new, but the term is essentially used to denote the 'new breed' of ZDF filters that also incorporate realistic, analogue-like distortion along with the qualities of ZDF filters, namely that they can be modulated quickly with minimal artefacts and have a good phase response. u-he claim that it's the zero-delay feedback filter that gives their Diva synth it's astonishingly 'analogue' sound. The horizontal central line in the waveform display of an audio editor (either standalone or within a DAW), representing zero amplitude -ie, silence. When chopping up audio samples, it's always best to make cuts at points where the waveform meets the zero crossing line, to avoid the nasty clicks that occur when 'instantly' jumping to/from zero (or the start/end value of an immediately following/preceding waveform) from/to a positive amplitude. Most audio editors feature an option to automatically snap edits to zero crossing points, although with left and right channels potentially differing in amplitude at any given moment, the effectiveness of this setting can't be guaranteed with stereo material. Many DAWs also offer the option to create fades automatically when cutting and slicing any audio (an option that's sometimes switched on by default), minimising the likelihood of clicks and pops by ensuring that the level is faded down to zero at the audio clip's edges. Your software DAW will always suffer some degree of latency between input and output - for example, the short delay between singing into a microphone routed to an audio channel and hearing it back through the speakers. The larger your audio interface's buffer setting, and the greater the latency induced by plugins, the longer the overall delay. To counter this when recording, most audio interfaces offer 'direct monitoring', whereby the input is routed directly to the interface's physical output (as well as the output to the DAW), thus enabling zero-latency (ie, with no delay) monitoring of the input signal. In truth, there is still a tiny amount of latency caused by the signal passing through the interface, but it's insignificant. Since this monitored signal has to bypass the DAW itself, however, you can't apply plugin effects to it, which can be an issue for singers and guitarists, who generally prefer to hear themselves with effects. As a workaround, certain interfaces include built-in reverb, delay, compression and other processors that can be applied to the input for monitoring purposes - and, indeed, recorded with, if desired. The characteristic 'ripping' sound that occurs when a stepped parameter of a digital instrument, effect or mixer is adjusted quickly. An unavoidable by-product of the discrete value changes involved in any digital system, zipper noise can be masked to a great extent using interpolation techniques or simply increasing the resolution of the controller.